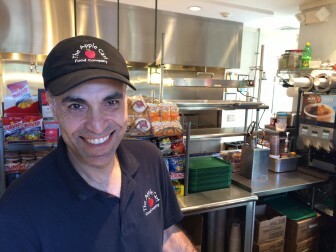 There could not be a better candidate for “Faces of New Canaan” than Emad Aziz. In this feature, we profile residents—typically through a Q&A, though not always—whom we associate automatically with our town, though they’re not people we necessarily know because they are famous or hold prominent local positions. These are people who make up the fabric of New Canaan in a profound, visceral way. This interview with Aziz by far ranked as the most difficult to secure, not just because he’s a naturally private person, but also because despite his truly remarkable journey to New Canaan—you will see, from our interview below, that his story is a triumph of diligence, acumen and instinct—he’s self-effacing, genuinely modest. Something else we learned from our interview: Aziz likely never would have come to New Canaan at all if not for Walter Stewart’s, where he answered an ad for a butcher (unknowingly) and ended up discovering the town through that prominent local business and family. Sincere thanks to you, Emad, for your candor and “letting us in” on your journey here. One final note before the interview itself: As many New Canaanites have, my brother Terry (and our sister, Rachel) worked at Walter Stewart’s—in Terry’s case, it happens that his time at the Elm Street market overlapped with Aziz’s. New Canaanite: My brother Terry remembers you from Stewart’s. Says to this day that you were best boss he ever had. How long have you been working in New Canaan? I came to New Canaan back in 1991. ’91. And what were you doing before then? I was actually a professional Jai-alai player. You were a Jai-alai player? Up in Bridgeport? You have to tell me about that. Where did you learn how to play Jai-alai? When I came to this country. It’s not a big deal. I want to hear about it because it’s interesting. I don’t know any Jai-alai players. I was introduced to Jai-alai when I first came to the country, back in 1981. How old were you at that time, when you came here? You were 17. Where were you coming from? Egypt. Where you were born. Did you come here alone or with family? I had my brother, my mom, my dad and sister. Where are you in the siblings? You’re in the middle? Me too. You have an older brother and a younger sister? Me too. So you all came here as a family. Where in Connecticut did you move? Right here, Norwalk. We lived in Norwalk. Had you already finished your high schooling in Egypt? Yes sir. And went right to Norwalk Community College. NCC. What did you get your degree in there? General Studies, Psychology, Languages and so on. Wow. OK. And your younger sister, did she finish her high school here in Norwalk? She had finished her high school and she went to college here, to California. OK. You’re 17. You pick up the sport how? I was introduced. Somebody said, “Oh let’s go to Jai-alia.” I never knew what Jai-alai was. I was brought over, and was absolutely baffled and impressed by it. Turns out there’s a place in Milford called American Amateur Jai-alai. And I was big into sports, I played soccer, of course. I started playing recreationally. Next thing you know I picked it up. Loved it, enjoyed it. Back in 1988 the traditional Jai-alai players went on strike. They decided to hire replacement players. And I tried out and was offered a contract and played for three years. What were you doing between ’81 and ’88? Actually food service. My first job was a place in Norwalk called Overton’s. That’s how I learned the business. As a matter of fact the system that is applied here is the same system that was applied there, except expanded a lot and totally manual. Does not rely on computers. Relies on brains. What did you do at Overton’s? Line cook. Line cook for the first year, and the following year I was assistant manager. What brought your family here in the first place, when you were 17? Well, we come from Egypt, and I’m Catholic, Egypt is a Muslim country of course. My father had no intention for us to serve in the military, which was mandatory there. It’s not optional, like it is here. So just before draft age, he made sure that everybody was moved out of the country. Both your parents are Catholic. Yes, my father was Catholic, my mom was Catholic. That’s a minority religion in Egypt. The population in Egypt is 10 percent Christians, like most of the Middle East countries. Do you still live in Norwalk? No, I live in New Canaan. You live in New Canaan. And are you a family guy yourself now? Yes, married with two kids. Are they in the schools here? Well, they are my partner’s children, and they graduated from New Canaan High School. Alex and Hannah. And so you’re doing the food service. Did you drop food service altogether when you went into the Jai-alai? I was lightly involved. Because Jai-alai was one of those temporary things. You never knew if it was going to continue or not. There was negotiations between the original players and the state of Connecticut. Maybe they work it out and come back, you know how it is when there’s a strike going on. So any time that could have just ended, so it was a very short-term contract. —And I was in Stamford for a time. Yes. And I owned a food service place, like a dairy mart operation and I owned that, me and my cousin. Oh, when did you open that? So that was five years after you got here. Graduating, Overton’s and then you open your own place. Where was that in Stamford? East Main. Whereabouts, above the highway or below the highway? Get off Exit 9, make a right. You know where Carvel was? I know where that is. So you have that in ’86, and you’re still doing that when you get into Jai-alai? Jai-alai just showed up and I was doing both, and I was working in a bank at the time, as well. So you were carrying three jobs, basically. What were you doing at the bank? So, you’re working a lot. What was your English when you came here? How did you manage at NCC? That’s why I took Languages, to ease into it. French, Italian. And five years later, you open your own business here with a cousin. That’s impressive. I like to work. Hard work was always in the family. We were taught that when we were young, that there’s nothing wrong with working hard. It gives you pride in your life in what you do. It’s a good thing. At this point in time, late-‘80s, coming into the ‘90s, what is your thought on New Canaan? 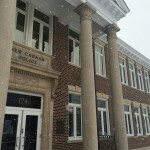 Have you been to New Canaan, do you know of New Canaan? You just know it’s some other place up here? Never heard of New Canaan. You’re just focused on your life and your business and Norwalk-Stamford area. Family. It’s funny how I got into New Canaan. After I finished playing Jai-alai, I realized it was time to pursue another career, because this is not a career. And I was looking in the paper for a job opening. And I saw an ad saying, ‘Looking for a person with experience in meats.’ So right away, I assumed it was deli meats and I had some experience in that, so I called, and I spoke with Linda, sister of Mr. Stewart, Bailey Stewart, the owner of Walter Stewart’s at the time, he’s retired now, and I was speaking to her, I was under the impression that they were looking for a person to manage the deli, and after a conversation of five or 10 minutes, she said, “OK, so you have butcher experience, that’s great. Come on in.” And I said, “Wait, what do you mean, butcher?” And she said, “Well that’s what the ad is looking for.” And I said, “Oh OK, I must have misunderstood. I read it differently.” And she said, “You know what? You sound really nice. Why don’t you come meet up with the owner anyway.” I went in and met up Bailey and he offered me a job as the deli and bakery manager at the store at the time, and I accepted. I thought it was a great opportunity and that’s how I was introduced to New Canaan. What were your thoughts at the time, as you started to get to know the town, the people through the customers, the Stewarts? Loved it. I’m a suburb kind of guy. I was born in a small town, similar to this—in my country, of course. What is the town called? Tanta. T-A-N-T-A. Tanta. It’s about 45 minutes away from Alexandria, which is of course a big city. About an hour away from Cairo, another big city where I actually was raised. Did not like it, because of all the noise and the sounds and the traffic and the high-speed movement. I just did not like it. It caused me too much anxiety, so I loved this and as soon as I came in, I liked the people and I liked the momentum and speed and tempo, everything. Everything. It was very clear to me that people in this town are often well off, polite and pleasant. And they are down-to-earth when they are dealing with you. And the Stewart family has been here for a long time. Their business is very much a part of the community. They’re deeply involved in the community, support nonprofits, local causes, community events. So that’s a good entrée for someone who wants to learn about New Canaan, is to come in through Stewarts. That was not the plan but it came in very handy. I got to meet a lot of people in town. I really never had any plans of pursuing my own business. As a matter of fact, one of the managers there always accused me of treating the operation there like it was my own business, I would never take any days off. I wanted to control it and was always there. My brother Terry remembers you as the best boss he ever had, all these years later. Twenty years later. He came on with you around ’92-’93 and he worked under you at the Italian Center when they had that thing going. He says, “Oh yeah, Emad was great.” So you did something right, I guess. The owner used to laugh, saying I stepped on his toes, I had so many ideas. I wanted to convince him to try it out [at the Italian Center] because it could be a great expansion for his name and operation. I’m the one that started the catering there at Walter Stewart’s, corporate and private catering. I said, “Let me try this out” and it worked out well, for me and for them. Did you finish up as deli-bakery manager or did you finish up as something else by the time you were wrapping up at Stewarts? Both our departments at the time had gotten so big that we had to split them up and bring in a bakery manager separately and I was still the manager at the deli and the catering. Deli and catering. So you were there from ’91 until when? What happens then? You go into this? No, I actually moved onto doing another partnership at Norwalk Community College, doing the food service with a gentleman that owns his own business, and offered me an opportunity to come in as a partner. The food service for students, the cafeteria. Ironically, back to Norwalk Community College as a food service operator. We went in there, spend a couple of years there, and after that I branched off on my own with the Apple Cart Food Co.
Wilton and New Canaan members there knew me. As a matter of fact, when I was at Walter Stewart’s, again somebody convinced me that used to shop at Stewart’s about doing the food service there [at the Lake Club], and I convinced the owner that it could be a great opportunity with the place being so close to town and so on, and we did it there for one year. It just did not work out as well as the owner had hoped, and he wanted me to concentrate more on the operation at the market. So after I left, they still approached me and said would you like to do the food service as your own company, the Apple Cart Food Co. and I gladly accepted, and I was there for nine consecutive years. Nine years at Lake Club? How did you get the name ‘Apple Cart’? Well, the plan was to open up either a deli or a storefront food store, and coming up with a name, I didn’t want it to be intimidating. I didn’t want a foreign name. I wanted something that indicates healthy, colorful, not too pricey, not terribly expensive yet has a little bit of elegance. The fact that it starts with the letter A is always a good thing. In the old days, they used to use the yellow phonebooks, so I would be up there. I like apples. Apples are healthy, “an apple a day.” So there’s a lot of reasons why I used the word ‘Apple.’ I like the idea of a cart, because I always visualized if I opened up a place, the decoration, the theme would be country-ish, stylish. And back then, that wasn’t that big in the early ‘90s. But that was my thought. As a matter of fact, I wanted to do half the store American deli food and the other side would be Middle Eastern, Mediterranean food, which is my specialty, and that’s the reason that falafel here is one of our key items. So you start Apple Cart Food Co., and if I’ve got my math right, the Lake Club for nine years puts us into the early 2000s? Apple Cart Food Co. now is a success, operating your own business out of the Lake Club. After the Lake Club, we signed on with the New Canaan Field Club as well. So you had two at the same time. And the Wilton Riding Club as well. Yes sir. All in the summer. And it’s a snack shack type model. Yes. [Laughs.] “Glorified snack bar,” that’s what I like to call it. So you have these three going still? We stopped at the Lake Club. They wanted to go in a different direction—always on good terms with everyone, Walter Stewart’s and the Lake Club and the New Canaan Field Club, where we operated for four years. We were at the Wilton Riding Club for about two years. When the opportunity came up with the town, I offered my name for the services, and it was this and then, later on, they decided to put a food service operation like this in Waveny Pool and Kiwanis Park. So there are three presences? Right, now we have five. We do St. Aloysius Catholic School in town, we do the food service there for the children, and we also have Roxbury Swim and Tennis Club in Stamford. Got it. And how often do you get back to Egypt? Since I came here, never went back, never will go back. Do you still have relatives there, extended family? Extended extended. Tell me about your family here, your parents, brother and sister. Thank you. I have an older brother who lives in Fairfield and my sister lives in Canada, both with their families and their children. When you look back on this journey, I mean—what age are you now? Fifty. Just turned 50 last year. You did? That’s a lot to pack into 33 years. I’m going to process it all, someday when I’m sitting at the beach. Tell me about you in New Canaan. How long have you lived in town? —Refereeing soccer at the high school. A lot of people know my face. A referee is one of those people who are spotted easily. Tell me about you and New Canaan. Do you relax here, hang out here? What do you enjoy about the town? What do you do here? If we go back to why I moved to New Canaan in the first place, I’m not big on big crowds. It’s just too much. I like my peace and quiet. I’m just a calm person because everything else in my life is controlled chaos. I did it to be part of the town, part of the community and also I enjoy it a lot. I love working with kids. I really have no problem communicating with children, whether it’s precise and strict and direct, or gentle and soft. I can do both. And it seems like the kids react properly to it. They are very receptive. As a matter of fact, after I finished playing Jai-alai, my two contemplations were working with children, or food service. I was contemplating the two at the same time. Do you ever go on vacation? It seems like you work all the time. I work all the time in the summer. And I am off all the time in the winter and my body and brain seems to have gotten used to it. It’s funny because if I go back, that’s what it was when I worked at Overton’s the first five or six years that I was in the country. It was a huge, long season for eight-nine months and then after that I was just done, doing nothing. And as it is now, my schedule is the exact same way. I recover from the madness. I read, spend my time catching up and hibernating. service, always with a smile, and he hires the greatest young people to work with him at Apple Cart. Baseball season at Mead Park would never be the same without him!